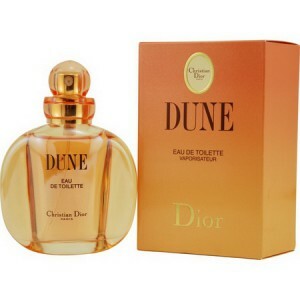 Christian Dior Dune is a sweet woody, slightly spiced ladies fragrance. Christian Dior Dune 100ml. Eau De Toilette is an essence that opens with woody, sweet, spicy tones are replaced gradually surrounded by a fresh breeze. Evokes the smell of the beach, and just as the product name, the bottle has the shape and color of sand dunes and imagine a female body wrapped in a warm veil that delight the senses. A feeling of relaxation and calm, usually played sand scaldat heat of bright sunlight. Magical, sensual and alluring Christian DIOR Dune is able to bring to mind any. Try it just once, you will not settle for anything less. Perfume Dune Christian DIOR - a scent of the early 90's, which is filled with the salty smell of the sea mixed with the sea breeze and the warm sandy beaches. With them, you forget about everything and relax be myself. Designed for women seeking peace, fragrance Dune Christian DIOR begins notes of bergamot, tangerine and mahogany blends in with floral notes are composed of rose and jasmine. Database - patchouli and vanilla. If you just want to buy and without fuss flavor Dune Christian DIOR , we will help you in this. Suffice it to leave a phone number and we'll call you back and help you choose the fragrance that suits you. Delicate and transparent with a refreshing floral-oceanic flavor. Escape to a world of dreams, is a kind of haven where modern woman can find peace and quiet. A world where merged breeze, the scent of flowers and bright glare on the hot sand. Amber fragrance intertwined with notes of fresh and cool sea air and the scents of peony and lily. For daytime. Established house Christian Dior in 1991. Top notes are aldehydes, peony, mandarin, bergamot and rosewood, middle notes are lily, jasmine, ylang, rose and wallflower; base notes are sandalwood, amber, patchouli, benzoin, musk, vanilla, moss.